How can we obtain the loan-to-value (LTV) in Margill Loan Manager? https://www.margill.com/wp-content/uploads/2017/02/jur-logo-margill-avec-spacer-top_EN-300x73.png 0 0 Marc Gelinas https://www.margill.com/wp-content/uploads/2017/02/jur-logo-margill-avec-spacer-top_EN-300x73.png Marc Gelinas2016-12-29 20:22:382018-10-05 19:11:37How can we obtain the loan-to-value (LTV) in Margill Loan Manager? 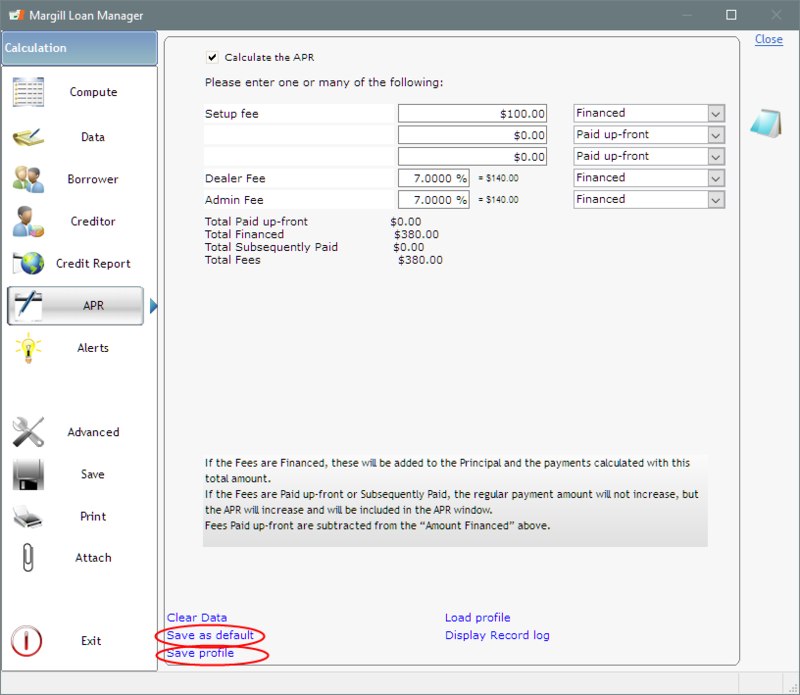 How can I set up multiple Global Initial Fees in Margill Loan Manager? How and where do I set the Initial 3 fees described above and can I have them only apply to “Auto” loans, but not to other types of loans? Notice on the bottom left (circled in red) that you can set this up as your Default for all new loans. To answer the second part of your question, can some fees apply only to some loans? Yes. You can save what are called “Profiles”. So these fees would not be set up as the Default but as a Profile for Auto loans. Since these three fees are financed, they become “principal” like (part of the total amount financed). The $9.63 in paid APR fees can even be subdivided by the 3 fee types you entered. This is done in the reports. Fees could also have been added as Line Fees and paid when you want then to be paid. You charge fees (“Setup Fees”: -$100 in the Payment column) and you tell the system when you want them to be paid (“Setup Fees Paid”: +$100 or other amount in the Payment column). Each of the fees below can be renamed. From an accounting perspective though, although a little less important, you should ask your accountant. https://www.margill.com/wp-content/uploads/2017/02/jur-logo-margill-avec-spacer-top_EN-300x73.png 0 0 Marc Gelinas https://www.margill.com/wp-content/uploads/2017/02/jur-logo-margill-avec-spacer-top_EN-300x73.png Marc Gelinas2016-12-23 14:11:492018-10-05 19:21:20How can I set up multiple Global Initial Fees in Margill Loan Manager? Why am I not getting the right amount of interest for a month? https://www.margill.com/wp-content/uploads/2017/02/jur-logo-margill-avec-spacer-top_EN-300x73.png 0 0 Marc Gelinas https://www.margill.com/wp-content/uploads/2017/02/jur-logo-margill-avec-spacer-top_EN-300x73.png Marc Gelinas2016-12-21 22:33:472018-10-05 19:12:10Why am I not getting the right amount of interest for a month? How do we update the interest rates for multiple records at once? https://www.margill.com/wp-content/uploads/2017/02/jur-logo-margill-avec-spacer-top_EN-300x73.png 0 0 Marc Gelinas https://www.margill.com/wp-content/uploads/2017/02/jur-logo-margill-avec-spacer-top_EN-300x73.png Marc Gelinas2016-12-14 23:19:272018-10-05 19:21:48How do we update the interest rates for multiple records at once? 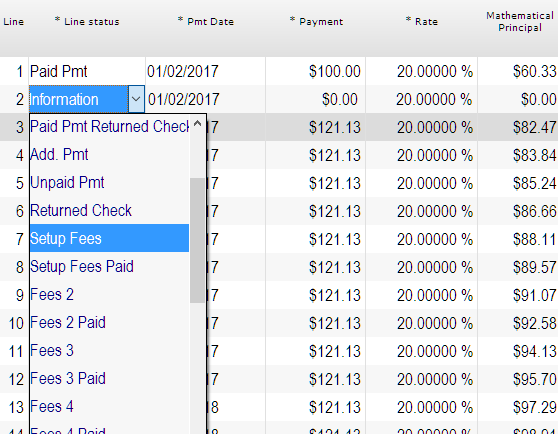 How to add late fees automatically? https://www.margill.com/wp-content/uploads/2017/02/jur-logo-margill-avec-spacer-top_EN-300x73.png 0 0 Marc Gelinas https://www.margill.com/wp-content/uploads/2017/02/jur-logo-margill-avec-spacer-top_EN-300x73.png Marc Gelinas2016-12-08 21:11:362018-10-05 19:22:33How to add late fees automatically? Question: How do you enter the record to write off a loan in the MLM?